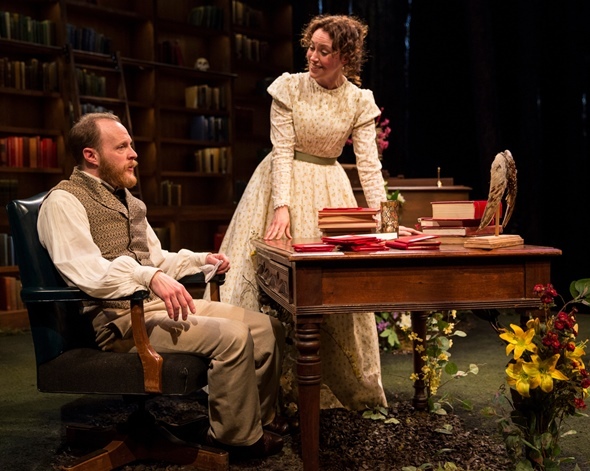 Scene upon witty scene, there is much to admire about Sara Gmitter’s elegant and facile new play “In the Garden: A Darwinian Love Story,” which in its world premiere at Lookingglass Theatre offers a kind of evolutionary portrait of the marriage of Charles and Emma Darwin. Floridly festooned in designer Collette Pollard’s literal interlacing of the natural and civilized worlds, “In the Garden” exudes a radiant, if benign charm. It is a sinfonia domestica cast, as it were, in a demure strain of C major, wherein the two gently contrasting themes of evolution (propounded by Charles) and an attentive, influential God (advanced by Emma) wind about each other through prelude, scherzo, adagietto (con variazione) and finale. 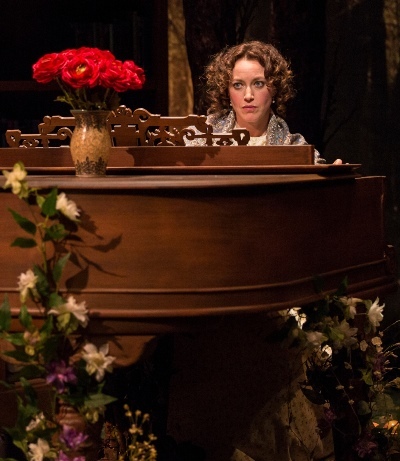 “In the Garden” is a sweet diversion, just not especially interesting. 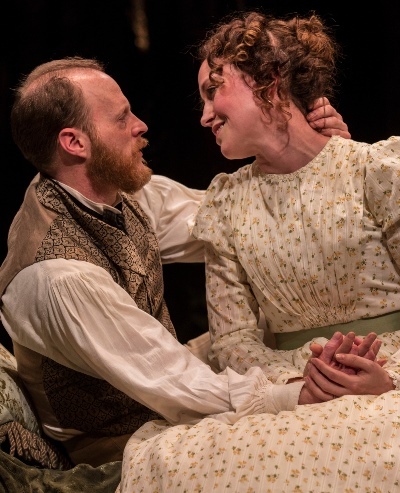 While Darwin (the intensely focused Andrew White) obsessively compiles evidence of natural selection, Emma (the spousally perfect Rebecca Spence) has babies and softly reminds him of his promise to keep an open mind about the possibility that God is in the details of our daily lives. He replies, “Yes, of course,” then repeats that he will embrace any truth that observable facts support; and she, sighing, once more stands down in wifely deference. What’s needed here, to make a plausible drama, is a healthy dose of conflict. The questions of God and the origin of the species surely are the most compelling in the realm of human contemplation. But all this domestic tact and rhetorical indirection adds up to little more than a sort of lesson-play, something for youngsters who have yet to experience the gritty exhilaration of free-wheeling debate. 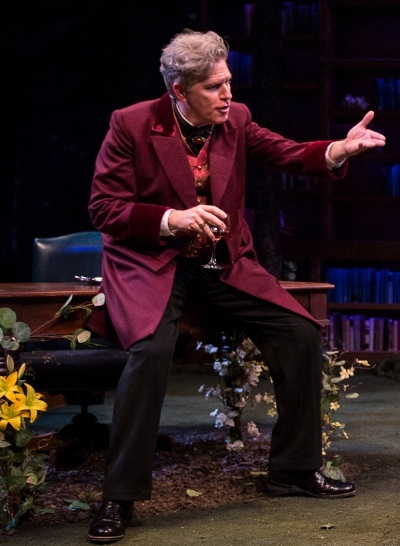 The play’s one spunky scene involves Darwin’s atheistic brother Erasmus (Austin Tichenor in one of several roles), who strides about the room mercifully unmuted and railing against the existence of God while commending Darwin’s work for helping to make his point. The moment is energized and funny as the uncomfortable Darwin tries to dodge such an alliance, if only for the sake of his marriage. This sharply written dust-up brought to mind two other plays that make better theater of the head-knocking between faith and reason: Mark St. Germain’s “Freud’s Last Session,” in which the great psychoanalyst (and atheist), near death, wrangles with the Christian philosopher C.S. Lewis over the existence of God; and David Ives’ “New Jerusalem: The Interrogation of Baruch de Spinoza,” in which the 17th-century Jewish philosopher Spinoza is accused of denying God. Gmitter, an artistic associate at Lookingglass, shows a deft use of language and a well-tuned ear for dialogue. Credit the cast as well for earnest, sympathetic portrayals. Both Tichenor and Cindy Gold make good work of sundry parts, though their multiple identities sometimes push the enterprise toward unintended farce. I loved the kids, Caroline Heffernan and John Francis Babbo, as the young Emma and Charles and later as the couple’s rambunctious children. Director Jessica Thebus fashions some lovely family moments. But ultimately I failed to see the point. Why were we peering into this couple’s household? If it were Chopin and George Sand, maybe. But seriously, who cares about the tender tussles between Charles and Emma? Drama is about struggle. Two hours bobbing on the waters of marital bliss hardly cuts it. Vine tendrils creeping up the piano legs? Lace up the gloves. Where are those unevolved animals George and Martha? I want Albee.